We have improved the previous part BBa_J23100 by adding RBS and pelB-5D to make it can be used for extracelluar expression. The combination of promoter, RBS and signal peptide makes it convenient to use as a Biobrick and gives it the function of extracellular expression. 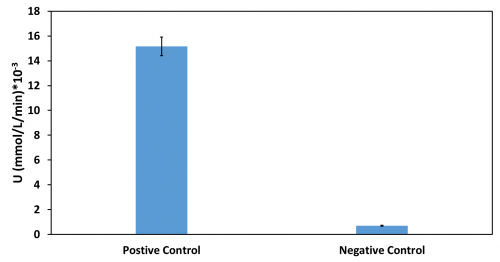 For the function determination, we chose the PETase as our reporter protein because its activity can be easily detected. Thus we constructed two plasmids with and without pelB-5D respectively to compare the function of our improved part and previous part. 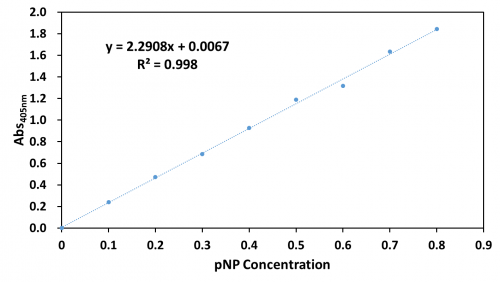 For quantitative assay, a standard curve of pNP ranging from 0-0.8 mM in 100 mM of phosphate buffer (pH 7.4) was measured. The activity of the extracelluar fractions was detected by the method of pNPB. And the results were as followed(Fig. 2). Based on our functional determination test results, the improvement that we did has succeeded. PETase that carrying our improved part (Fig. 2) has much higher activity level than the PETase that carrying promoter BBa_J23100 but without pelB-5D. From our experiment result, we could conclude that our improved part indeed gives the promoter BBa_J23100 the function of extracellular expression.